Whether it's your love of Halloween, Tim Burton or Jack Skellington that inspires it, a Nightmare Before Christmas tattoo can be a fun way of showing your passion. Tim Burton's iconic movie, The Nightmare Before Christmas, debuted in 1993. His claymation creation presents holidays in a new light. Rather than an event that occurs once a year, Burton proposed that those who create the holidays known as Halloween and Christmas reside in towns where the sole point is to get ready for the big day. There are several characters in The Nightmare Before Christmas that have inspired love, passion and creativity amongst fans. These characters are frequently seen depicted as tattoos on fans of the movie. Jack Skellington is the movie's lead; a skeleton who wishes there was more to his life. Skellington's image is a popular tattoo amongst fans of the movie who may also wish there was more in their present life. Skellington's head is frequently tattooed alone, or the silhouette of his body may be seen against the moon. Sally is the rag doll who loves and believes in Jack Skellington despite his trials. Sally is a popular Nightmare Before Christmas tattoo amongst women, and is sometimes paired with Skellington to depict true love. Oogie Boogie is the movie's villain; the dark shadow who haunts nightmares. A large sack filled with bugs, Oogie Boogie may be used as a tattoo image for those with a particular fondness for Halloween tattoos. Lock, Shock and Barrel are Oogie Boogie's henchmen, three children who live for trick or treating and do Oogie Boogie's bidding. The three characters, displayed with or without their masks, are another popular Halloween themed tattoo. Movie posters for The Nightmare Before Christmas show a large, yellow moon behind a curled cliff. This cliff unfurls as it is walked on, and is a scene showed multiple times throughout the movie with Jack and Sally both alone and together on it. The moon and cliff is a popular, large back tattoo for fans of the movie, both alone and paired with one or more of the movie's characters. Skellington's dog Zero is also seen frequently in tattoos from the movie. Zero can usually be seen paired with Skellington, or with Skellington and Sally. The Nightmare Before Christmas is filled with various characters including vampires, a demonic clown, the Axe Man and others. Many fans of the movie have a favorite lesser character that they may choose to tattoo the image of. The reasons behind this can be a feeling of relation to the character, or merely a simple love for the image. 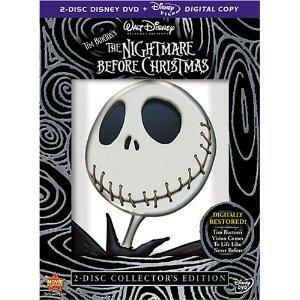 A Nightmare Before Christmas design can be a way to display both the playful and deep sides of your nature. The very things that made the movie so popular including the imagery, meaning and depth of feeling produced are the very things that make these tattoos popular as well.